Use the buttons to the right to review the two bucks you are aging then guess their age using the "Guess" button. The real fun is to read the comments as to the rationale for your guess. Both bucks have been accurately aged by DeerAge.com and the results will be displayed in September. Contest Rules - You may only enter once. Multiple guesses will disqualify you. Winners will be chosen on 9/15/2016. People who correctly choose both buck 1 and buck 2 will be entered into a random drawing for a chance to win the prizes. Aging deer is fun! A lot of hunters truly enjoy knowing how old their buck was when it was taken. Many hunters use DeerAge on deer they found dead as well. 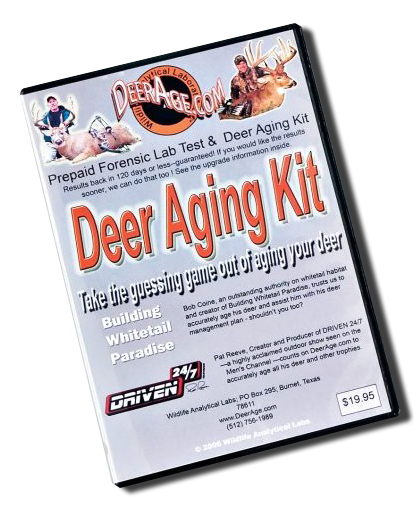 Aging provides valuable information on your deer herd's age structure as well as to help validate your age estimate. Many hunters age does too! Shooting a mature Alpha doe can be the hardest animal to kill in your forest. Give DeerAge.com a try.